Why Does Garlic Turn Blue When Pickled? When pickling or cooking garlic, sometimes it turns a turquoise or bluish-green color. Don't worry; this is perfectly normal and doesn't mean there's something wrong with the garlic. If you prefer white garlic in your recipes or gifts of canned vegetables, you might think there is something wrong with it. The science behind this effect is related to the same things that give garlic its signature odor and taste. If you're not crazy about the color, there are some things you can try to prevent it. Garlic contains an odorless sulfur compound called alliiun. It also contains an enzyme called alliinase. When a bulb or clove of garlic is in its natural, whole state, the two chemicals have little interaction (and the garlic is relatively odorless). When you cut or crush the garlic, the alliiun and alliinase are mixed, creating an organosulphate compound called allicin. This is what gives garlic its pungent odor and distinctive flavor. And that's why garlic gets only stronger the more you chop or crush it. When garlic is combined with an acid (such as vinegar), the allicin reacts with amino acids in the garlic to produce rings of carbon-nitrogen called pyrroles. Pyrroles linked together form polypyrroles, which throw colors. Four pyrroles clustered together create green (this is why chlorophyll is green). Three pyrroles linked together creates blue. A similar color-forming reaction can occur when the garlic is in contact with minerals from certain metals, including copper, aluminum, iron, and tin. The minerals can come from pots or pans made of those metals, or it can come from trace minerals in the water. Can You Eat Blue or Green Garlic? Garlic that has turned blue or green during pickling or cooking is perfectly safe to eat, and the presence of color has no effect on the garlic's flavor. Some cultures even prize colorful garlic. In China, garlic is deliberately pickled in such a way that it turns a jade-green and is consumed during the Chinese New Year, or Spring Festival. This "Laba garlic" has a sour, slightly spicy flavor and is considered both beautiful and healthful. Use distilled water for pickling; distilled water doesn't have the trace metals found in a lot of tap water. Use iodine-free salt; most kosher salt and sea salt does not have iodine. Use stainless steel or enameled cookware and utensils; avoid copper, aluminum, cast iron, and tin. Blanch the garlic briefly (about 10 seconds or so); this may or may not prevent coloring and can affect taste, so try this judiciously. 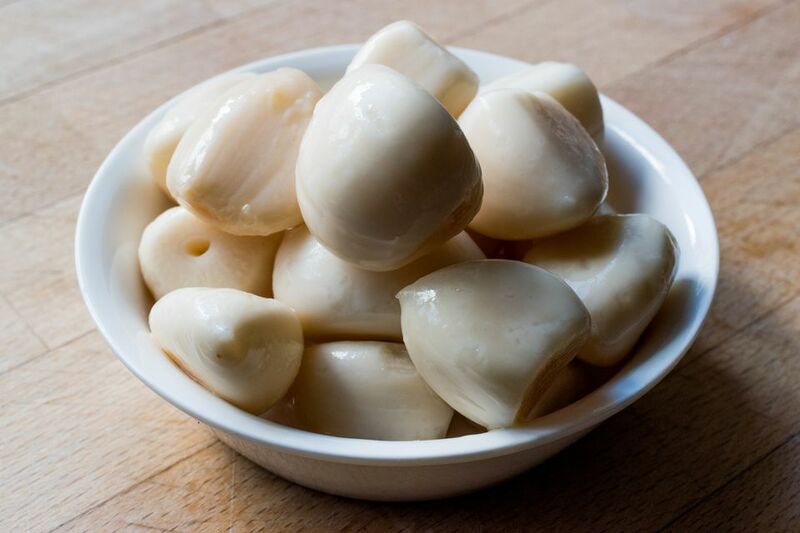 Store fresh and pickled garlic away from sunlight, which can lead to chlorophyll formation.